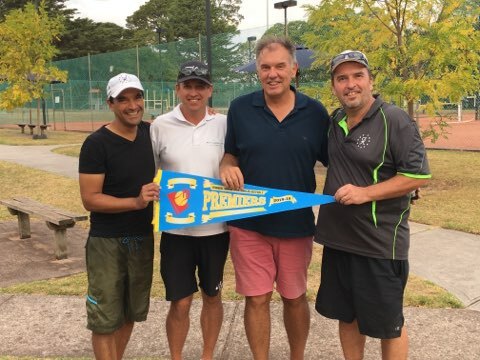 It was a hot and sunny day at Overport Park last Saturday that saw the Ranelagh old men take on the fast-improving youngsters from Bruce Park in the Grand Final of the PTA Open Singles section 3. With an injury to Tony Miles late in the season seeing him heading up the cheer-squad, Simon Cummins and Rob Parton took up the doubles challenge and the Ranelagh team managed to hold it together at a couple of crucial games in each set to get over the line 6-4, 6-3 and winning the first important point for the team in a tight-fought match. With the 2 singles matches playing side-by-side, it wasn’t the start that Arvind Sridharan and Rob were looking for. Rob managed to turn things around to crawl over the line in the first set 7-5, while Arvind’s younger opponent continued to play flawless tennis to take the first 6-2. The pressure was on. Rob was battling it out but finally dropped the 2nd set 4-6. On the other court however, the match had turned and Arvind raced through the 2nd set 6-1, which meant 1-set all in both singles matches. Fortunately for the team, Arvind continued his form and won the third set to secure overall victory for the Ranelagh old men. With the required 2 matches won, relief for Rob (and the defib machine which was on standby) as it was mutually agreed to call it a day. Congrats to the Ranelagh team on the win and a great season.